Choosing an O’Fallon Lawn Care provider can be a difficult task. Your lawn is special to you and you don’t want a bad job done. While choosing lawn company after lawn company this only adds to the stress. At Greenside our employees have been with us 6+ years with thousands of hours of experience, you won’t have to worry about the quality of service. We do not require a yearly contract, so you can see when our work is completed, the work will stand for itself. We simply go the extra mile with our service and often do above and beyond the customer’s request. The customer can change the frequency of the service throughout the year. Seasons change and having your lawn cut weekly might not be needed. We strive to provide the absolute best O’Fallon lawn care in St. Charles County. 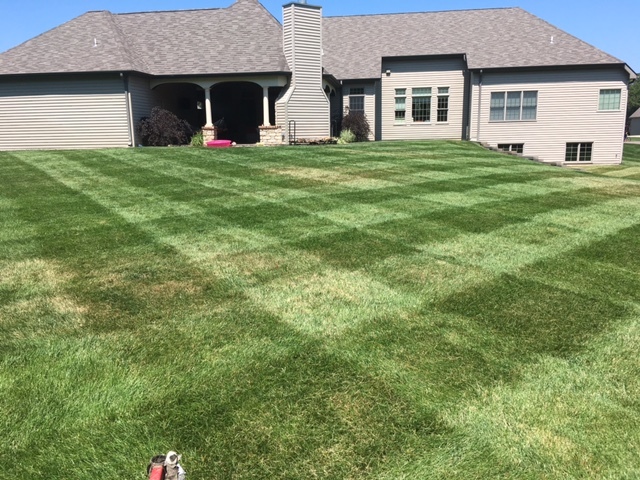 The best part about Greenside is we can be that “all-in-one” company that you can rely on to completely take care of all your O’Fallon lawn care needs. We not only do lawn care but we offer services such as bush trimming, mulch and rock installation, complete plant designs and installs, removal of existing landscaping and lawn fertilization, aeration, and complete lawn restoration. Greenside does even offer snow removal as well. We have very competitive pricing and most of the time the cost is less than you think. When choosing an O’Fallon lawn care provider, we offer the best all-around service. There are custom packages that you can request additional services like bush trimming and to have it done 3 times a year so it’s always looking great.